The Model Citizens show during New York Design Week unearthed another gem: Paper No.9, a Brooklyn company that designs stylish, cruelty-free bags and accessories. At first glance, its wares resemble well-worn shearling leather, but close inspection reveals their true origin: paper. By treating recycled shipping cardboard with natural oils, heat, and a good massage, then backing it with canvas for strength, the green-minded label has created a velvety-soft “fabric” that can be used to stylish effect. And the product just gets better with age. Body heat and movement gradually wear away the outer layers to reveal hidden artwork beneath. Paperlicious style. 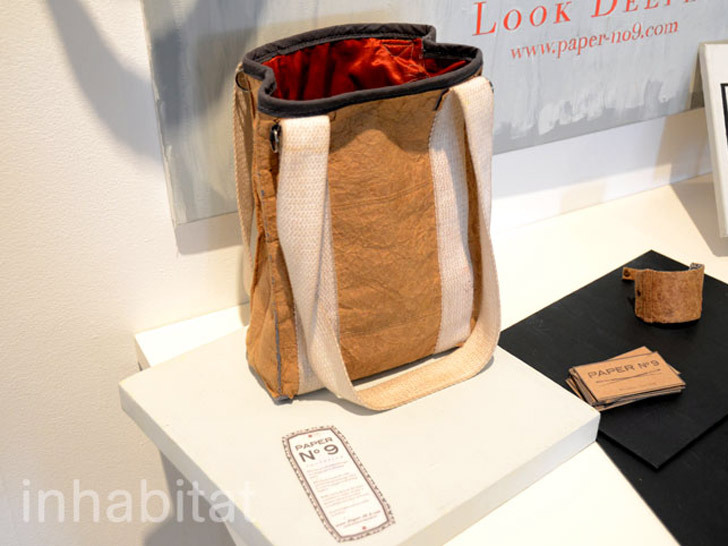 The Model Citizens show during New York Design Week unearthed another gem: Paper No.9, a Brooklyn company that designs stylish, cruelty-free bags and accessories. At first glance, its wares resemble well-worn shearling leather, but close inspection reveals their true origin: paper. By treating recycled shipping cardboard with natural oils, heat, and a good massage, then backing it with canvas for strength, the green-minded label has created a velvety-soft �fabric" that can be used to stylish effect. And the product just gets better with age. Body heat and movement gradually wear away the outer layers to reveal hidden artwork beneath. Paperlicious style.